Grief. Like a live, writhing entity in your gut. Once you've experienced it for yourself, you know it's near impossible to describe what it felt like. Impossible to use any existing words to relay the pain that carved irreparable wounds onto your entire being. Therefore, you know that if someone decided to write a book dedicated to grief, that this someone had to have survived this tidal wave of suffering. Found avenues that led to some kind of healing. The Beauty that Remains felt like a genuine attempt at capturing the many ways people begin to heal after loss. I just had a hard time inserting myself into the sorrow-I just couldn't make it past the surface level of that pain. Three people have died. In three very different ways. This book follows the three people closest to them who must now learn to exist in a world void of their presence. We follow Autumn, who lost a best friend, Logan, who lost a lover, and Shay, who lost her twin sister. Writing multiple perspective narratives is surely a feat for a seasoned author, nevermind a debut one, so I admire Ashley Woodfolk for her choice. Each character, remaining and deceased, was obviously written to be diverse in personality, which for me, didn't come across as loudly as the diversity of their ethnic backgrounds, which was DELIRIOUSLY refreshing. For the majority of the novel, I felt like the characters were interchangeable when it came to their quirks, flaws, and dialogue. There were some individual hobbies, yes, but with music being the focal point of all of their lives (and one specific band at that), it was harder to separate each of them in my mind, even after scenes of joint interaction. Most importantly, my empathy, my sympathy, and my real tears were kept closely locked away for the entirety of the novel. I never completely felt overwhelmed by Autumn's moments of unfiltered grief, or Shay's immeasurable longing for what used to be, or Logan's rage at an unjust situation. I just couldn't bring myself to care about the people that use to be a part of their world, and then just wasn't anymore. There was emotion spewing out by the bucketloads, but the deceased just never felt real enough to me. Woodfolk's writing was admirable for a debut, but I am looking forward to reading a narrative from her that weighs less on the subject matter scale, something that wasn't trying to evoke all this emotion, all at once. Cshley Woodfolk graduated from Rutgers University with a BA in English and her life-long love of books led her straight to the publishing industry. She's a member of the CBC Diversity Committee and markets books for children and teens. In her abundance of "spare" time, she writes contemporary YA. Indie movies, beer, books, and burgers are a few of her favorite things. She lives in Brooklyn with her husband and pit bull puppy, Winnie. 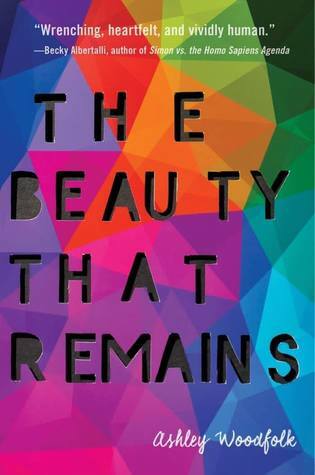 THE BEAUTY THAT REMAINS is her debut novel.